Okay, the trading strategy that we will learn today is "The Stochastics Overbought Oversold Trading Strategy". Its pretty self explanatory by itself. 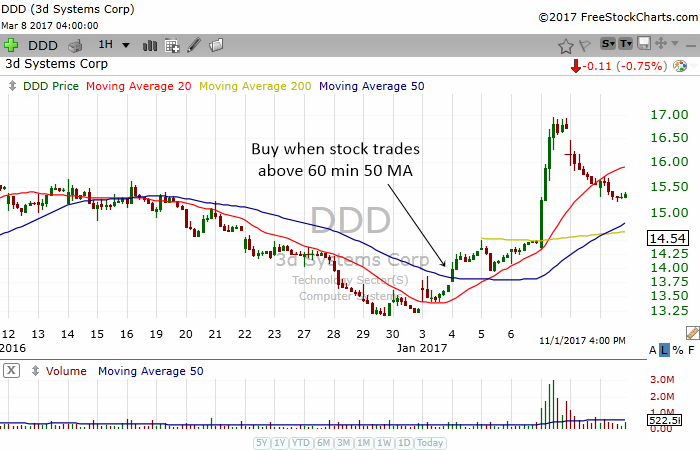 This is a swing trading strategy where we will hold stocks from 1 day to 5 days. 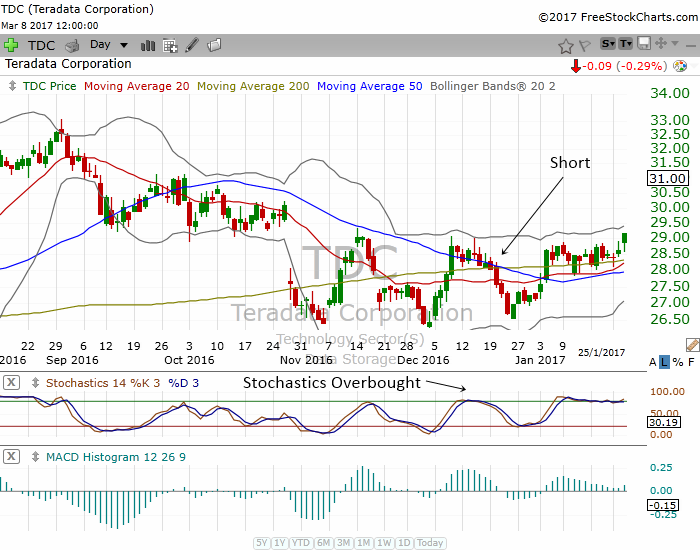 We attempt to buy a stock when it is oversold and we short stocks that are overbought. There are 2 components in this strategy. One is long a stock the other is shorting stocks. However, because they use the stochastics and find signals of overbought or oversold its pretty much the same except with the direction. You just flip it around. Although there will be some small nuances which sets a long trade from a short trade apart. A picture is worth a thousand words. The chart below shows the setup that we are looking for every single day to find long setups. The 3rd criteria with concerns the 60 min 50 MA is shown above. 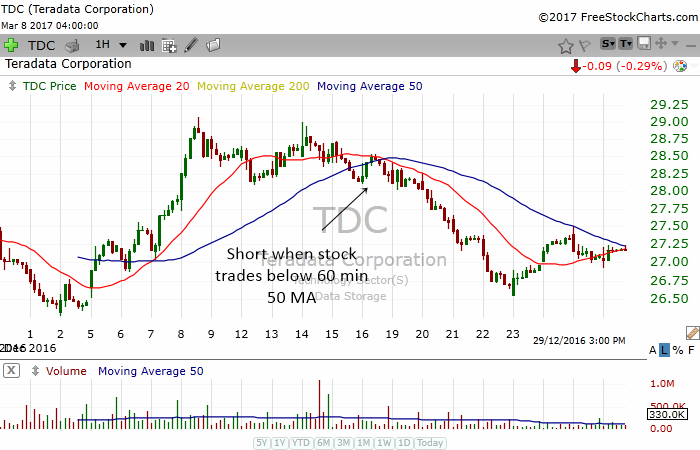 We will only buy the stock when the stock crosses above the 60 min 50 MA. In my experience, stocks are much safer to buy when they are above their 60 min 50 MA. We may be a bit late at times but it will give us much higher accuracy. 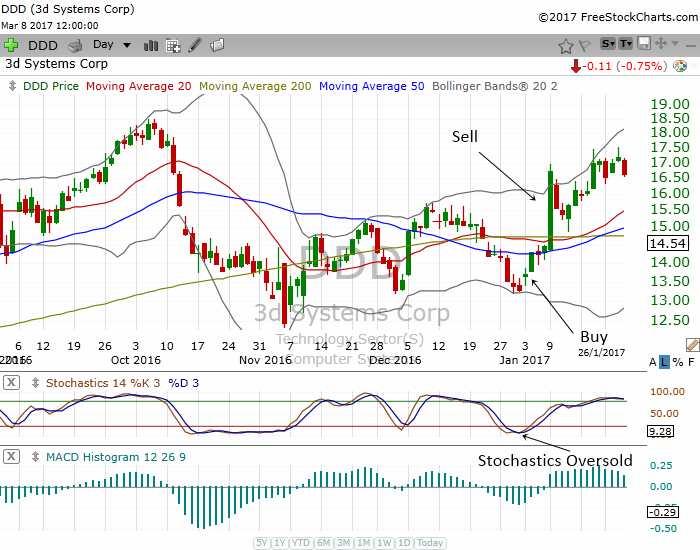 The short setup happens when we spot a stock with an overbought stochastics. All the criterias for the long setup we can just flip it. The chart above shows how the 3rd criteria must be satisfied. We only short stocks when they are below their 60 min 50 MA.